Acute pain is pain that comes on quickly, can be severe, but lasts a relatively short time. Chronic pain is persistent pain that lasts longer than three to six months. One in five people now live with chronic pain. Women and men of all ages and races are affected by chronic pain. Chronic pain affects more people than cancer, diabetes, heart attack, and stroke combined. Chronic pain can affect anyone at anytime and there is no known cure from chronic pain at this time. Chronic pain comes along with a host of other issues including lack of sleep, fatigue, lack of focus, depression, anxiety, and isolation, to name a few. No, pain is not in your head but it does live in your brain. What does that mean? All pain stems from the central nervous system and spinal cord. The central nervous system, the spinal cord, and the brain are connected. 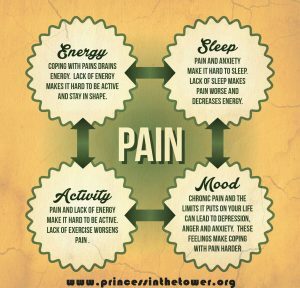 The pain response is supposed to be an alert system for the body to get itself out of harms way. Example: You hit your thumb with a hammer. 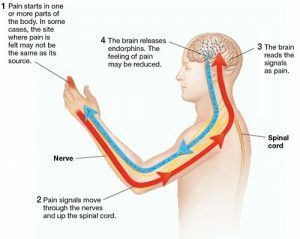 The pain signal is sent from your thumb up your arm to your spinal cord and to your brain. Then a different signal is sent back telling your body to move your thumb and flinch. A person not living with chronic pain would be able to experience acute pain, in this case the hammer and the thumb, and be able to heal and move on. A person living with chronic pain is able to heal, but the pain stays because the signals from the brain and central nervous system and spinal cord are compromised. YouTube: Chronic Pain – Is it All in Their Head?